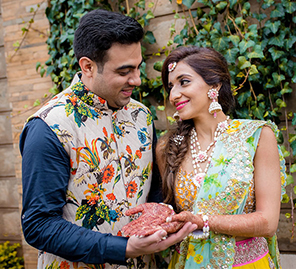 Historic castles and charming restaurants in Germany came alive with Patrick and Ritambhara's vibrant Indian wedding celebrations. After being in a relationship since they were teens, Ritambhara and Patrick knew it was time to tie the knot. After a memorable proposal a decade later from the time they started dating, the couple hosted their lovely wedding celebrations at different spots in Germany. 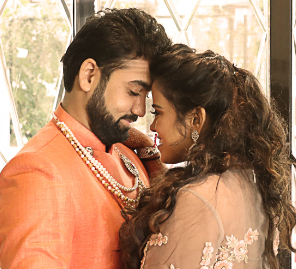 The moments were captured by WeddingSutra Favorite - Nitin Arora Photography who created a treasure trove of memories for them to savor for a lifetime. Patrick and Ritambhara first met when they were around 15 years old. What started as casual dating developed into a serious commitment over time. Through the years, they grew together as well as individually and both pursued different careers. While Ritambhara joined their family's restaurant business, Patrick became a consultant. He traveled a lot and stayed in Frankfurt sometimes on his business trips. The two dated for ten years before telling their parents they want to get married. Once they had the approval of their families, the couple had a roka ceremony. After that, Patrick planned a wonderful proposal at Ritam’s favorite castle - Schloss Heidelberg. With the permission of her parents, he took her out pretending they were going to a work event. Later, he insisted on having coffee at a cafe in the castle as he had never been there. After hesitating for a while, she put on an evening gown and agreed to accompany him. He promised to click a few nice pictures of her around the castle as she was wearing a pretty dress and had dolled up for the date anyway. Once there, he cleverly escorted her to the proposal spot, where he went down on one knee and asked her if she would want to be his better half forever. Sonakshi Gaba from Moonray Events helped the couple plan their wedding while Wedlock Invitations by Ashna Nayyar designed the beautiful invites. Jasmin from Jasmin’s Henna Art was the creative hand behind the bride’s mehndi and makeup. Nitin Arora Photography was entrusted with the responsibility of preserving the couple's precious moments and the team captured beautiful images for their wedding album that proved to be a timeless treasure-trove of memories. Ritambhara and Patrick got engaged at Marbella, which is a pretty restaurant in Hainburg. The setup relied heavily on the color white to add elegance to the celebration. Once the rings were exchanged, the groom‘s side passed the traditional 'matki' (earthen pot) for the fun and celebratory 'jaago' ('Wake Up') ceremony. The families came together as one big happy group and conducted the function together. The following morning, the duo were lawfully wedded at a calm and beautiful civil ceremony at another gorgeous castle - Schloss Philipsruhe in Hanau. The bride was resplendent in a white wedding gown, and the groom opted for a smart grey suit. While the families left for lunch after the ceremony, Ritambhara and Patrick went for a long drive instead. On the same evening, Ritambhara’s siblings invited guests and their close friends to a colorful Indian cocktail party that was hosted at Blaues Wasser in Frankfurt in honor of the couple. The Blaues Wasser is built right by the Main river, and its location added the ultimate wow-factor to the party. It was mandatory for all the guests to come colorfully dressed. Indian clothes and jewellery were provided to all, thus giving everyone, especially the couple’s European friends, a chance to experience the vibrant revelries of India. While all the guests indulged in the scrumptious spread and danced the night away, the couple had the opportunity to mingle with their near and dear ones. The day began with the haldi ceremonies for the bride and the groom at their respective homes. While Ritambhara’s haldi ceremony ended around noon, since she had to get her mehndi applied right after. Patrik’s haldi ceremony went on for hours! On the fourth day of their celebrations, Ritambhara and Patrick got married in traditional style. The 'chooda' (bridal bangles) ceremony marked the beginning of the auspicious occasion, and soon enough, it was time for the pheras. The function took place at The Salin Event Palace in Maintal where an outdoor mandap was set up. The reception commenced with Ritambhara and Patrick’s dreamy waltz. A beautiful cake was cut, and the dance floor and buffet were opened for guests after that. The families and friends of the two danced until it was time for the bride’s farewell. Once again, the decor was dominated by white and included a stage with a backdrop that was enveloped in fresh blooms.